“Exactly which olive trees do you want to see? The Israeli settlers have cut down thousands. Can you be more specific?” asked the taxi driver, telling IPS that he wished to remain anonymous. 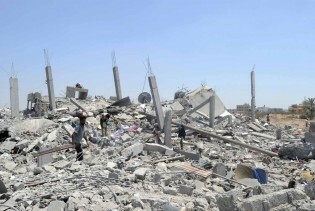 Despite all the political hoopla surrounding an international pledging conference in Cairo last October to help rebuild Gaza, the reconstruction of the Israeli-devastated territory is apparently moving at the pace of paralytic snail. Ongoing military conflicts in the strife-torn Middle East - specifically in Iraq, Syria, Libya and Palestine - have resulted in widespread civilian casualties, impacting heavily on the most vulnerable in besieged communities: women and children.